Many churches have members devoted to seeking out the needs of the community and helping to fulfill those needs. Sometimes it can be collecting food for the local food pantry, donating sheets to a women’s shelter, or even cleaning up a neighborhood park. Wollaston Congregational Church, UCC, in Quincy, however, decided plumbing was one of the best gifts they could offer. The Wollaston church has partnered with City Mission Society (CMS) for many years. Through the CMS Boston Urban Outreach program, groups from across the country have come to the Wollaston church to engage in mission work for local organizations such as thrift shops, food pantries, shelters and meal programs. In the past, the church has provided the groups with air mattresses, use of the church kitchen, and a large screen television. The one thing missing, however, was a place to shower. "After their day of volunteer work, groups would have to take a train and then walk to the Quincy YMCA, a hot and tiring journey in the summer, and an expensive one as well," said Peter Johnston, the church’s former Minster of Music. So in 2011, under Johnston’s leadership, the church embarked on an experiment in radical hospitality: install new showers in its 1915 stone Parish House. The “Showers of Blessing Project” -- after a feasibility study and architectural plans were prepared -- was estimated to cost $10,000 to install 3 shower stalls, each with a private changing area. With that goal firmly in mind, Peter and his fellow members began a grassroots fundraising campaign by asking the mission committees of local churches, and the youth groups who stayed at the church in the past, to contribute money for labor and supplies. In May of 2012, a youth group from Central Congregational UCC in Meriden, Connecticut, struck the first blows and broke through the walls of an old office and storage area in the Parish House. A licensed contractor and plumber were engaged and the work on the new showers formally began.When the professionals had finished, the work continued, using donated materials and volunteer labor to complete the project. A group from Kansas laid the ceramic floor tile and painted the shower room walls. 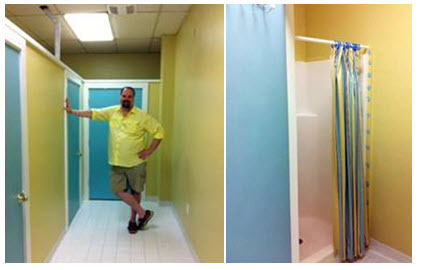 Peter Johnston poses in front of Wollaston’s bright and cheery new showers -- a welcome sight to mission volunteers. In the first two weeks of operation, Wollaston hosted a group of eight from First Federated Church of South Berwick, Maine, who stayed two nights; a group of fifteen from Stanley Presbyterian Church of Overland, KS, and Shenkel UCC of Pottstown, PA who stayed for seven, and a group of twenty from the Mystic Congregational Church, UCC, in Mystic Connecticut, who stayed for five nights. Combined, these groups touched thousands of lives through their service projects. "Having the showers in place guarantees that the church and City Mission Society can adequately host large groups, which can then go out into the community and do good works,” says Peter Johnston. For information on using the space at Wollaston, contact the church office at wollastonadmin@comcast.net, or 617-773-7432. To inquire about City Mission Society’s Boston Urban Outreach Programs, contact Carl McDonald via email at cmcdonald@cmsboston.org, or by phone at617-742-6830, ext. 10.